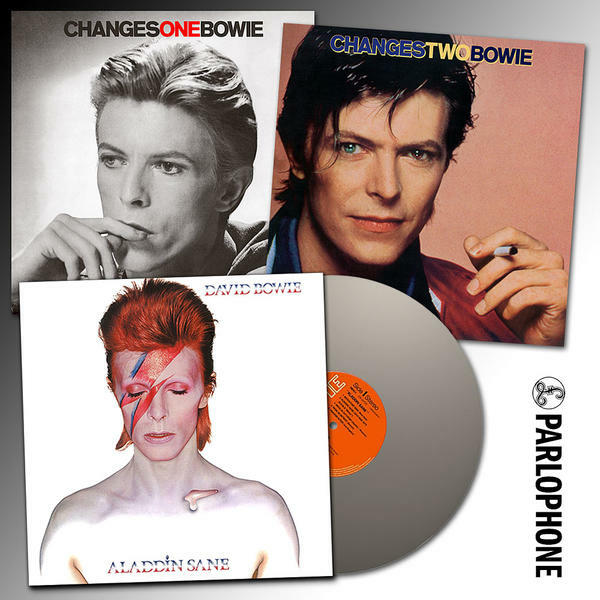 April sees the release of two limited edition Bowie vinyl albums, Aladdin Sane and CHANGESTWOBOWIE. This strictly limited one run only silver vinyl edition of Aladdin Sane will contain Ken Scott’s approved 2013 remaster and will be released on 20th April, 2018, 45 years to the day since the original release date for the album. Previously thought to have been issued on 13th April, 1973, new evidence has come to light that proves the release date was officially the 20th, but being Good Friday in the UK the album was 'made available' on the 19th. This silver vinyl edition of Aladdin Sane will only be available to ‘bricks and mortar’ retail stores and not through on-line stores. CHANGESTWOBOWIE will be reissued on the 13th April with all tracks remastered on CD in a digipak sleeve, high-resolution 192/24 and 96/24 digital and standard digital for streaming and download, as well as a 180gram vinyl edition available randomly on its initial limited run in black and blue vinyl before reverting solely to black vinyl. Finally, 192/24 and 96/26 high-resolution digital versions of CHANGESONEBOWIE will be released for streaming and download on April 13th too. 2017 saw gold vinyl versions of Hunky Dory and The Rise And Fall Of Ziggy Stardust And The Spiders From Mars, released 45 years to the day of the first issuing of Ziggy. To celebrate the 45th Anniversary of the ALADDIN SANE album; there will be a special limited edition silver vinyl version released. This follow up to David’s hugely successful first Best Of compilation CHANGESONEBOWIE, has not officially been available since the late 1980s. Featuring iconic cover photography by Greg Gorman, it was first released in 1981 and was only briefly available on CD in 1985 but has long since been deleted. Drawing on material spanning from HUNKY DORY (1971) to SCARY MONSTERS (AND SUPER CREEPS) (1980) it achieved gold status in the U.K. album chart in 1982. It will be reissued on the 13th April with all tracks remastered on CD in a digipak sleeve, high-resolution 192/24 and 96/24 digital and standard digital for streaming and download, as well as a 180gram vinyl edition available randomly on its initial limited manufacturing run in black and blue vinyl before reverting solely to black vinyl. 192/24 and 96/26 high-resolution digital versions of CHANGESONEBOWIE will be released for streaming and download on April 13th. Will be released on Parlophone 20th April, 2018. Will be released on Parlophone 13th April, 2018.